This little demonstration, by Canyon Swartz, is a perfect example of how no matter how small you are, you can use your talent to the glory of Christ Jesus! Painting a clear picture of Jesus! “Jesus is coming soon” the sign proclaimed. The old ragged-looking man holding the sign stood facing the traffic at the corner. Despite the fact that I cringed at the man’s delivery, I realized that I, too, wanted to be bold for Christ. Often I've thought if I were accused in a court of law of being a Christian that there wouldn't be any evidence to convict me. But God always has a plan for each of us even if we don’t see it right away. As I spent time each day with the Lord, things in my life changed. God had given me multiple talents and a creative mind, and all of it was being wasted on my own glory. As the Lord showed me a better direction, I dedicated my talents back to Him for His glory. Suddenly, even my workplace became a mission field in my mind. I left books and tracts in the lunch area for the employees to discover. I started painting Bible pictures in the park, and when interested wanderers would come over to investigate, I would share the story of Jesus and give each person a book or DVD and pray with them. 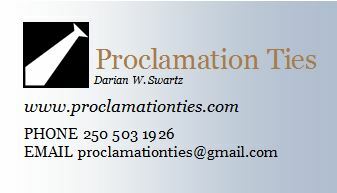 Likely these Proclamation Ties are my boldest “sign” that I have attempted to date. The pictures are inspired from God’s Word and are digitally printed from my original neckties on 100% silk. Included in each one is a bookmark that gives a basic Bible study to help the wearer understand his necktie and be able to share their love for Christ with others. Jesus IS coming soon and I am not ashamed to proclaim it.